Look Up It’s Game Day! Go Hawks!! Damn it!!! I go into living and being in the moment yesterday that I didn’t blog. I had planned on doing it between or maybe during the Boy’s football end of season party. Which almost was a disaster because the Mini Helmets that we give out (instead of trophies) were slow in shipping so they were not going to be delivered until Monday! I tracked them down and drove to DuPont, which is about an hour away, to get them. We set up the ‘trophy’ table with personalized cookies that I had made for everyone with the Helmets. It looked so cute and the party was a blast. Kids had fun coaches and parents bonded some more before departing for the off season! I love football season! Can’t wait for next year! After the party we met up with some of our besties, and my phone died so even if I hadn’t “forgotten” I wouldn’t have been able to blog anyway! But you know it was nice to not have my phone or as the Hubs calls it my leash! I have been trying over the last year or so to not be so attached to my phone (except when I am blogging on the way to a Hawks game like today). I love my friends. The best part about them is that we don’t see eachother as much as we used to but we still love each other and have as much fun as always even when we add a new person like yesterday! It was fun we danced and sang and bonded and plain just relaxed. Most phones stayed in pockets we didn’t even take selfies we just were together, laughed and enjoyed each others company! 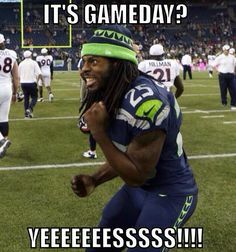 Now today is Seahawks Day!!! It’s a night game but the Hubs and I are going over early and going to enjoy the day together! It’s our day and since I’ve been working during away games we really like to take it in and enjoy the day with each other and no other responsibilities! Enjoy your day Friends! 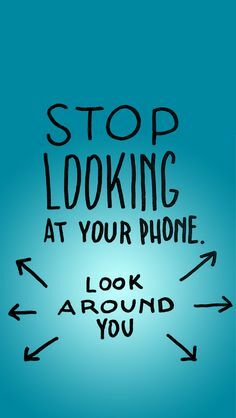 Look up from your phone and enjoy life in the real world! You can catch up on Facebook later!